Hillary Clinton keeps telling America that she's too stupid to address the economy and, if elected president, she'd put her husband in charge. Math is so hard, says our new Barbie. If Hillary's not up for the job, she shouldn't be going for it. The idea of a supposed 'feminist' announcing she'd turn the job over to her husband is disgusting all on its own. When she's also lying about the past, it's outrageous. -- Near Beiji, a strike struck an ISIL weapons factory. -- Near Fallujah, two strikes struck two ISIL tactical units and destroyed 19 ISIL fighting positions, two ISIL vehicles, four ISIL heavy machine guns, four ISIL rocket propelled grenade systems, eight ISIL light machine guns, three ISIL recoilless rifles and an ISIL mortar system and denied ISIL access to terrain. -- Near Kisik, two strikes struck an ISIL tactical unit and suppressed an ISIL mortar position. -- Near Mosul, three strikes struck three separate ISIL tactical units and destroyed an ISIL mortar system, an ISIL supply cache and an ISIL vehicle. -- Near Qayyarah, four strikes struck three separate ISIL tactical units and an ISIL headquarters and destroyed an ISIL fighting position, an ISIL assembly area and two ISIL mortar systems and suppressed a separate ISIL tactical unit and denied ISIL access to terrain. -- Near Ramadi, two strikes struck two separate ISIL tactical units and an ISIL fighting position. Additionally, officials said, two strikes in Syria near Manbij that struck two ISIL tactical units on June 12 were not included in yesterday’s strike release. US President Barack Obama has been bombing Iraq daily since August of 2014 and we're all supposed to pretend that is working. Pretending requires forgetting that on June 19, 2014, Barack insisted the only answer to Iraq's crises was a political solution. Since August of 2014, there's been no work on a political solution, no diplomatic infusion, just bombing -- just bombing and US Secretary of State John Kerry mistaking himself for the Secretary of Defense. The bombings don't address the issues that led to the rise of the Islamic State in Iraq. The issue isn't whether the rule is Shia or not, it's what sort of rule they're subject to. It's certainly better than ISIS, but it's not good enough. What Baghdad needs to do to make sure that Sunnis and Shia and Christians and atheists are satisfied with their rule is to completely reform they're institutions. So far, that's something Baghdad has been completely incapable of. Until that happens Iraq will be extremely vulnerable to terrorist attacks, to infiltrators, to civil unrest. That's the recipe for the next few years at least. Again, this isn't being addressed with bombings. The attempted liberation -- or 'liberation' -- of Falluja continues. Well, for one thing, it's going with more US involvement in what is undeniably combat. Yesterday, US Secretary of Defense Ash Carter declared, "In that connection, while we're still in Iraq, perhaps worth mentioning that in the last 24 hours I guess it was, the commanders have used the Apache capability that we positioned there and that the president authorized them to use some months ago when they found an opportunity when that might make a difference. And that did occur and an ISIL target was destroyed as a consequence of that." We'll note the remarks in full that the above was pulled from but we need to emphasize that this was a new development. Tom Vanden Brook (USA TODAY) explains, "Their use represents a deepening of American involvement in the war against the Islamic State, also known as ISIL." Barbara Starr (CNN) points out, "The U.S. had been pressing the Iraqi government for months to accept the offer to call in Apaches to help across Iraq in the fight against ISIS. The offer was rejected by the Iraqis in their campaign to retake Ramadi, but the U.S. official said the Iraqi government recently accepted the support." Secretary Ash Carter: In Iraq, the operation to position forces for the envelopment of Mosul continues according to the plan that I think first talked with you all about some five or so months ago when we first devised it. The -- both the forces moving north and positioning themselves in two locations called Makhumr and Karia West, which are respectively southeast and southwest of Mosul, comprising the pincher from the southern direction. And then the two brigades also trained and equipped by us approaching from the KRG territory and other Kurdish-controlled territory in the north. That continues to proceed at pace, and those forces continue to move in the way that was anticipated. I only emphasize that because there's also operations going on in Fallujah, and obviously, that's an important operation as well. That we are also assisting, but Prime Minister Abadi has -- who is -- and it's his forces, the Iraqi security forces, that are in command of both of these operations -- we're supporting them -- in command in the Fallujah operation. And just to remind you that the prime minister has indicated that his forces are commanding that operation and that it will not take away from the forces that are scheduled to move and are moving and some of which have already into position south of Mosul, and that's good. In that connection, while we're still in Iraq, perhaps worth mentioning that in the last 24 hours I guess it was, the commanders have used the Apache capability that we positioned there and that the president authorized them to use some months ago when they found an opportunity when that might make a difference. And that did occur and an ISIL target was destroyed as a consequence of that. 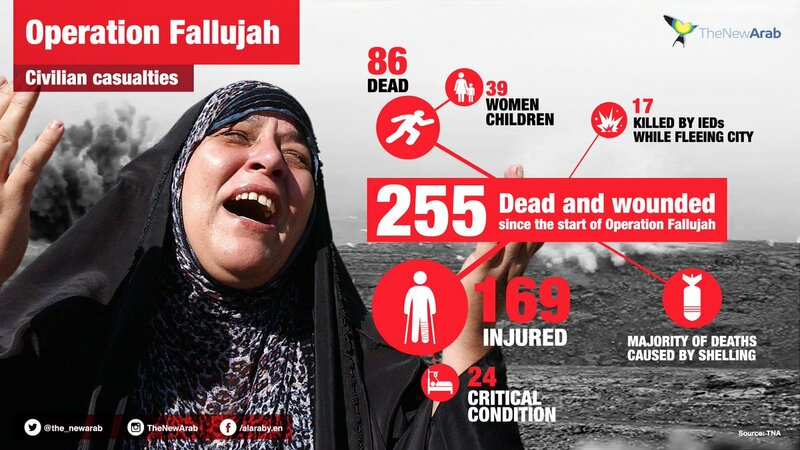 Back to Falluja, how's that going? Along with civilians killed in air strikes, there's also the civilians being held (and tortured). AP offers, "Since the Iraqi government launched its offensive May 22 to retake Fallujah from the Sunni-led extremists, the troops have been detaining all military-aged men for questioning as they flee the city west of Baghdad. They want prevent any of IS militants from slipping out among the civilians to fight elsewhere." Okay, let's pretend that was proper English. It would be "They say they wan to" -- unless, of course, AP now practices mind reading. Human Rights Watch has rightly noted, "The military routinely separates men from women and takes the men for security screenings to determine their involvement with ISIS forces, according to all witnesses Human Rights Watch interviewed. The authorities may impose reasonable and proportionate security measures, but should do so under judicial supervision and in a transparent manner, Human Rights Watch said. The families of anyone detained should know where they are being held, and all persons detained should promptly be brought before a judge to determine the legality of their detention." AP fails to note that reality. AP's a bit like the US government in its willful denial of reality when it comes to the civilians of Falluja. The governor of Anbar Suhaib al-Rawi came out with a damning report on Saturday on killings, torture and imprisonment of Fallujah civilians by members of the Iraqi Shiite militia who are backing government troops in the battle, adding that the city is being unjustifiably destroyed. The governor added that these images of abuse have frightened the people of Fallujah who are trapped in the city between Islamic State (ISIS) rule on one side and daily bombardment on the other. The assault/liberation of Falluja has created thousands of refugees. Iraq - IOM is closely monitoring displacement from Fallujah in response to ongoing military operations in and around the city, which intensified on 22 May 2016. IOM’s Displacement Tracking Matrix (DTM) Emergency Tracking identified a total of 43,470 internally displaced Iraqis (7,245 families) from Fallujah district between 22 May and 13 June. This includes 10,548 individuals (1,758 families) who fled between 11 and 13 June; the displaced have arrived mainly to Amiriyat Al Fallujah, with a smaller number to Al-Habbaniya sub-district (both in Anbar governorate), as well as to Baghdad governorate. A displaced widow from Fallujah, named Nagham, spoke with an IOM staff member about her displacement. “I have five children. When ISIL came to the area we couldn’t leave because three of my children are very ill. After the recent military operation many families escaped by foot, taking back roads. I fled with two of my children and had to leave my other three behind with their grandmother and relatives; they were planning to leave by car. I have not heard from them since then. We are in urgent need of supplies and assistance." Since 29 May IOM has been assisting displaced persons from Fallujah, the majority in Amiriyat Al Fallujah, through the distribution of more than 3,600 non-food items kits. These kits include lightweight summer blankets, towels, plastic mats, a cool box, rechargeable fan, rechargeable light, gas cooker and a hygiene kit, first aid kit, and sewing kit. Distributions were conducted in cooperation with local authorities, and funded by the USAID Office of Foreign Disaster Assistance, and the US State Department’s Bureau of Population, Refugees, and Migration (PRM) and the Government of Germany. Additional distributions are planned to respond to the most urgent needs. The latest report from IOM Iraq’s DTM, published this past week, updated the figure of internally displaced persons (IDPs) throughout the country to 3,306,822 individuals (551,137 families) from 1 January 2014 through 26 May 2016. The majority of the displaced are originally from two governorates: Anbar 42 percent (1,396,788 individuals) and Ninewa 35 percent (1,149,492). The entire displaced population is from 8 of Iraq’s 18 governorates. The governorates hosting the largest IDP populations are Anbar 17 percent (578,208), Baghdad 16 percent (535,050) and Dahuk 12 percent (397,290). Amid continuing displacement, many Iraqis have started to return to their location of origin. A total of 726,336 individuals (121,056 families) are reported to have returned as of 26 May 2016, indicating an increase of 11 percent (69,558) since 28 April. Returns are mainly to the governorates of Salah al-Din (303,588 individuals), Ninewa (129,198) and Diyala (130,980), thanks to improved security conditions. Anbar governorate witnessed the highest increase in returns during the April 28 – May 26 period (33,000 individuals). This increase was especially high in the districts of Ramadi and Heet, where local authorities have facilitated return movements to areas declared safe. The DTM is funded by the US State Department’s PRM. 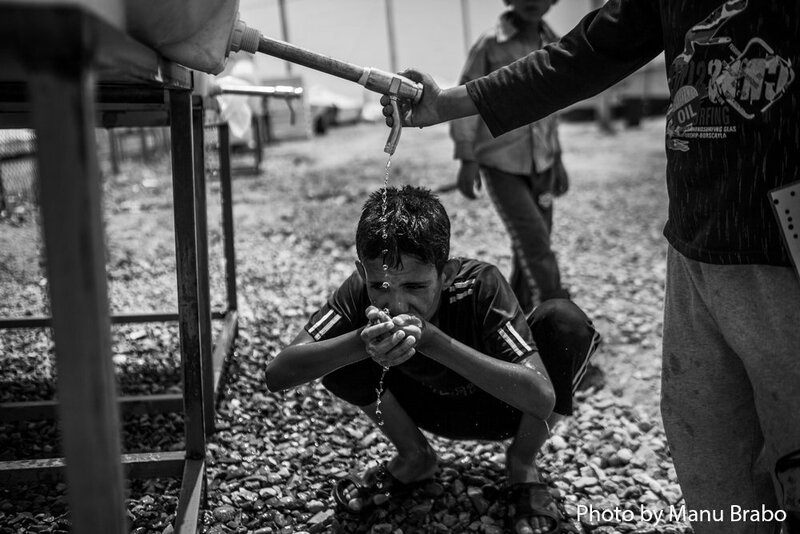 Meanwhile aid and assistance remains an issue throughout Iraq. In the past year, we have provided more than 20,000 consultations between the mobile clinics and the health center, and this is just a drop in the ocean when compared to the need for assistance in the region. There are more than 3.3 million Iraqis displaced in their own country, and Baghdad alone houses more than 600,000 of them. These are families who were living in their towns or villages and have now lost everything. Many live in unfinished buildings, in schools, mosques or in makeshift settlements, often in very difficult and poor conditions. In Abu Ghraib in particular, we see that people suffer from limited access to water, poor sanitation facilities, and overcrowded housing. These conditions are exacerbated by the impending summer with temperatures reaching up to 50° C [122° F]. With the poor living conditions and the limited access to health care, we see many preventable diseases such as respiratory and skin infections, but also patients who suffer from chronic diseases like hypertension, diabetes, and heart disease and cannot access their regular doctor or obtain their medicine. In a normal environment they would manage their conditions through the national health system, but the conflict has not only forced people out of their homes, it has also left many health facilities damaged or destroyed, or simply short of staff. One of the main challenges is the lack of humanitarian actors in Baghdad and the surrounding areas. Most international organizations are focused on the northern part of the country where the situation is more stable and secure. More humanitarian actors engaged across different fields, not only health care, are essential to meet the basic needs of the people here. My role as field coordinator is to make sure our medical teams—doctors, nurses, pharmacists and health promoters—can treat patients with minimal barriers. This means I spend a lot of time meeting and negotiating with people from different sections of society: government authorities, security officials, and community and religious leaders. We need to make sure they understand who we are, why we are here, and what we are doing. In this context, ensuring that people understand our independence and neutrality is crucial. We treat everyone who comes to our clinics regardless of where they are from or what they believe. Of course, I don’t do this alone, our team in Baghdad has more than 50 people, and many of them are also working behind the scenes to make sure the medical teams can spend as much time as possible with the patients.